Oakblue butterflies may use a variety of chemical strategies to deceive ants and avoid their attack, according to a study published April 8, 2015 in the open-access journal PLOS ONE by Yoko Inui from Osaka Kyoiku University, Japan and colleagues. Certain plants have a mutualistic association with ants and are generally well-protected from herbivore attacks by the ant. However, larvae of Oakblue butterflies survive and develop on specific plant, Macaranga, or ant-plant species (the host), without being attacked by the ants living on the plant (known as plant-ant species). 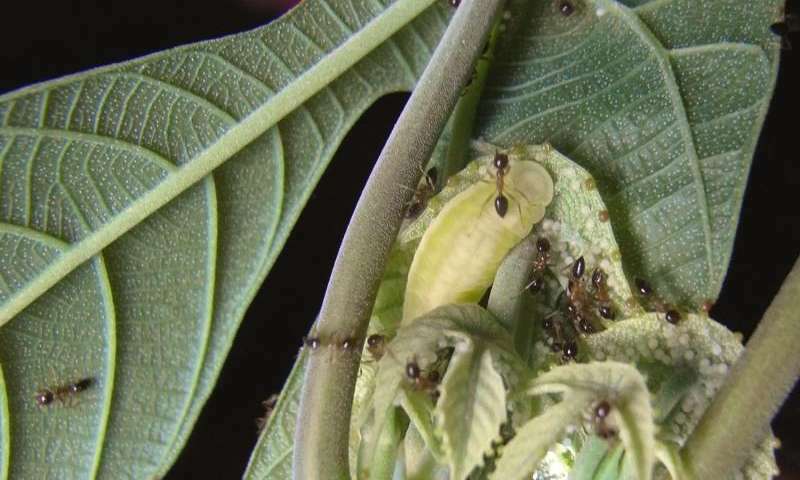 The authors of this study hypothesized that the butterfly larvae may chemically mimic or camouflage themselves and be accepted by the plant-ants on their host plant, and therefore would not be accepted by other plant-ant species living on plants that are not their normal host species. To understand this process, the scientists collected butterfly larvae for three Arhopala species in Malaysia and then analyzed the plant-ant species behavioral and chemical responses to the experimental introduction of butterfly larvae, as well as larval dummies treated with cuticular hydrocarbon extract, to the leaves of Macaranga species. Cuticular hydrocarbons are chemicals that play an important role in insect communication. The experiments revealed that although the responses of the plant-ants to the butterfly larvae varied considerably depending on the butterfly species, attacks by plant-ant species on the normal plant host were infrequent. Chemically speaking, however, A. dajagaka matched well the host plant-ants, A. amphimuta did not match, and unexpectedly, A. zylda lacked hydrocarbons. Behaviorally, the larvae and dummies coated with cuticular chemicals of A. dajagaka were well attended by host and non-host plant-ants, A. amphimuta were often attacked by non-host plant-ants, and A. zylda were ignored by all ants. The study authors suggest that variations exist in the chemical strategies used by the gossamer-winged butterflies that allow them to avoid ant attack and be accepted by the plant-ant colonies.